NEC is ushering in a new era of visual experience with the 98" X981UHD. 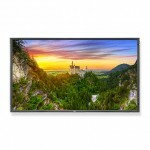 The display sets new standards in image size and quality with a 98" canvas with UHD (3840 x2160) resolution at full 60Hz. State of the art innovation delivers 24/7 runtimes with high end components and LED backlighting. Ideal for any industrial application, from control rooms to conferencing to life size digital signage.